Chewjitsu - Green Belt 60mLGreen Belt from ChewJitsu by 80V takes your favorite chewy, sweet, and ta..
Bean Town - Soul Custardy 60mLSmooth and flavorful defines this vanilla custard with very subtle bou..
Bean Town - Morning Spoon (was Krunky Hoops) 60mLWe tried to strike that elusive balance of dry frui..
Bean Town - Cinnarolly 60mLRolly, my father in law - only vapes cinnamon liquids and commissioned th..
Bean Town - Oh Face 60mLA unique take on the obligatory strawberry. 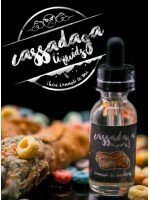 Arguably the most well crafted a..
Pye Liquids - Butter Pecan Toffee Pie 60mLRich, flaky, butter pecan pie with a toffee finish rounds ..
Pye Liquids - Key Lime Pie 60mLA true-to-its-name flavor that’s all class, with no gimmicks. Featuri..
Liquified - Mahalo Cool Breeze 60mLMahalo Cool Breeze is Mahalo with a cooling and refreshing LIGHT ..
Liquified - Mahalo 60mLMahalo is our interpretation of the original Hawaiian punch recipe. Originall..
Drip Vault - Drizzled 60mLDelicious and velvety vanilla bean ice cream coated with a decadent carame..
D-Rudd - Smores 60mLWe started with a homemade honey graham cracker and sandwiched it with toasted, ..
Smooth-E Liquid - Pineapple Mango Smoothie 60mLAfter nailing what we feel to be the ideal smoothie b..
Smooth-E Liquid - Mixed Berry Smoothie 60mLAfter nailing what we feel to be the ideal smoothie base ..
Smooth-E Liquid - Strawberry Banana Smoothie 60mLAfter nailing what we feel to be the ideal smoothie..
80V - Bean Bags 60mLBean Bags is a warm, flaky pastry filled with sweet milk icing, and coated with ..
80V - Honey Mellow 60mLHoney nut cereal, marshmallows, a hint of golden graham cracker, and just a w..
80V - Souly Cannoli 60mLSouly Cannoli starts as a perfectly balanced blend of the award-winning Soul..
Cassadaga - Cannoli Be Breakfast 60mLCannoli Be Breakfast by Cassadaga Liquids presents a deep fried..
Cassadaga - Cannoli Be Reserve 60mLMany have asked for the original Cannoli Be One with a decadent c..
Cassadaga - Cannoli Be Nuts 60mLCannoli Be Nuts is a take on the original Cannoli Be One with the ad..
Cassadaga - Cannoli Be Mine 60mLCannoli Be Mine by Cassadaga Liquids presents the sweet rendention o..
Cassadaga - Cannoli Be One 60mLA yummy cannoli shell filled with sweet vanilla multi-layers of cream..